A new study of Peruvian frogs living at a wide variety of elevations—from the Amazon floodplain to high Andes peaks—lends support to the idea that lowland amphibians are at higher risk from future climate warming. The region in and around Manu National Park is known for long-held records of biodiversity including more than 1,000 species of birds—about 10 percent of the world's bird species—and more than 1,200 species of butterflies. In addition, the park contains an estimated 2.2 percent of the world's amphibians and 1.5 percent of its reptiles. 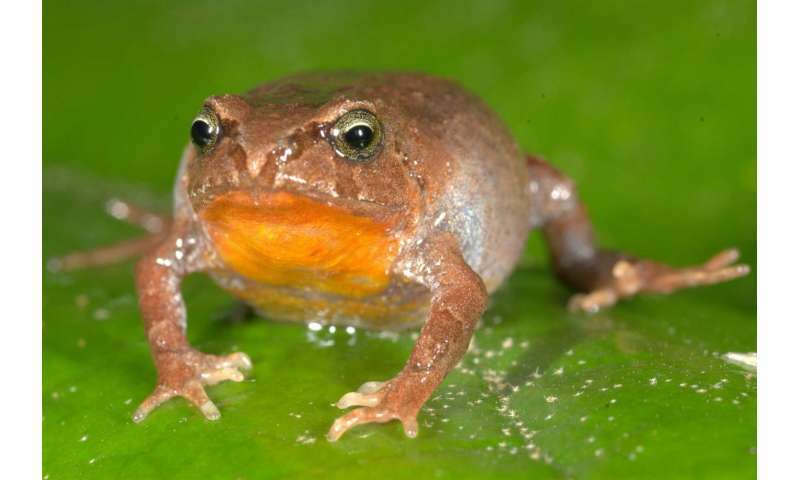 "These measurements were taken in order to determine whether tropical frogs could take the heat—or cold—predicted for tropical regions as a result of climate change," von May said. I wonder, did the frogs have the same issues during the 400 years (CE 850 - CE 1250) it was warm enough to grow vineyard grapes in Newfoundland, Nova Scotia, Scotland and Scandinavia? When it was warm enough for Barley, Wheat and Dairy Cattle farming on Greenland? During the longer growing seasons concurrently noted in China? More scientists in bed with politicians who want to use "climate change" supposedly caused by man, to pick our pockets. Note they didn't they disclose their funding sources in this report, but being from a government funded university they probably didn't want to tell readers they were picking their pockets either. Note they didn't they disclose their funding sources in this report, but being from a government funded university they probably didn't want to tell readers they were picking their pockets either. Ummm, they did identify the funding - it came from a combination of public and private funds. The paper is freely available, so it's a failure on your part that you didn't see it. As you've indicated, you didn't read the paper and your comment is just a knee jerk political response on your part. There doesn't seem to be anything controversial about the paper, other than the fact that it disagrees with your personal political beliefs. What part of the empirical data do you disagree with? Since you didn't read the paper, it doesn't appear that you're interested in science at all - why do you come here? Just to spout your political beliefs?